The special mixture of reality, fantasy, and virtuosity that is particular to early Netherlandish painting is nowhere more apparent than in this exquisite panel. 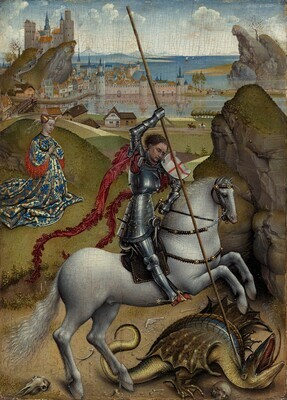 In an episode from the popular legend, Saint George in black Gothic armor pins the dragon to the ground with his lance; at the left kneels the fashionably attired Princess Cleodolinda who was to have been sacrificed to the dragon. George was a Roman soldier living in third-century Cappadocia, but the setting has here been transformed from ancient Asia Minor to the contemporary Belgian countryside. Passing through a series of overlapping hills, we come upon a walled city surrounded by water and dominated by a castle perched atop a fantastic mountain. This scene is almost certainly imaginary and yet is rendered with the greatest clarity and realism. The attention to specific detail has led to the suggestion that the artist made use of a magnifying glass. The artist's interest in the depiction of light -- reflecting on George's armor and the dragon's scales -- and atmospheric effects shows the influence of Jan van Eyck. The painting is also stylistically related to manuscript illumination that would suggest this is an early work. The panel may originally have been part of a larger ensemble, perhaps a diptych, and was most likely used for private devotion. Possibly Grudna-Grudzinski family, Poznan. General de Plaoutine, Saint Petersburg by 1902, Nice by 1917, and London by 1920; purchased 1923 by Lady Evelyn Mason [d. 1944], cousin of General de Plaoutine's wife, London; by inheritence to her daughter, Mrs. L.A. Impey, Chilland, Hitchin Abbas, near Winchester; (sale, Sotheby's, London, 16 March 1966, no. 1); purchased by NGA. A seal at the lower right corner of the panel reverse bears a coat of arms that has been identified with a high degree of probability as that of the Polish family Grudna-Grudzinski. Mention of the painting in their collection has not been found. It should be noted, however, that Joanna of the house of Grudna-Grudzinski married the Russian Grand Duke Constantine on 24 May 1820. She received the title of Princess von Lowicz (Jnowraczlaw) from Czar Alexander. If the painting did belong to the Grudna-Grudzinski family, it is possible that it came to Saint Petersburg through the person of Joanna. Perhaps it was given to her as a wedding present. Claude Philips, "Impressions of the Bruges Exhibitions," The Fortnightly Review, N.S. 72 (1902), 598, is the earliest mention of the painting being in the Plaoutine collection, Saint Petersburg. Plaoutine still owned the picture in 1920; see Pictures and English Furniture of the Chippendale Period [exh. cat. Burlington Fine Arts Club] (London, 1920), no. 30. The General himself did not live in London, however. Mrs. L.A. Impey, in a letter of 20 August 1984 to John Oliver Hand in the NGA curatorial files, states that Plaoutine emigrated to Nice in 1917 and in 1920 sent the painting to his wife's cousin, Lady Evelyn Mason (Mrs. Impey's mother), in England. He asked her to try to sell the painting, but, the English galleries being short of resources at the time, Lady Evelyn finally bought it herself in 1923. Mrs. L.A. Impey, letter to John Oliver Hand of 20 August 1984, in NGA curatorial files. Pictures and English Furniture of the Chippendale Period, Burlington Fine Arts Club, London, 1920, no. 30, as Hubert van Eyck. Flemish and Belgian Art 1300-1900, Royal Academy of Arts, London, 1927, no. 20, as attributed to Hubert van Eyck. Flemish Art 1300-1900, Royal Academy of Arts, London, 1953-1954, no. 1, as Attributed to Hubert van Eyck. Pictures from Hampshire Houses, Winchester College and Southampton Art Gallery, Winchester-Southampton, 1954, no. 13, as Attributed to Hubert van Eyck. L'Art flamand dans les collections britanniques et la Galerie Nationale de Victoria, Groeningemuseum, Bruges, 1956, no. 1, as Attributed to Hubert van Eyck. European Pictures from an English County, Thomas Agnew & Sons, Ltd., London, 1957, no. 41, as Attributed to Hubert van Eyck. Rogier van der Weyden, Rogier de le Pasture, Official Painter to the City of Brussells, Portrait Painter of the Burgundian Court, Museé Communal de Bruxelles, Brussels, 1979, no. 3Y. El Renacimiento Mediterráneo: Viajes de Artistas e Itinerarios de Obras entre Italia, Francia y España en el Siglo XV, Museo Thyssen-Bornemisza, Madrid; Museu de Belles Arts de València, 2001, no. 27, repro. Prayers and Portraits: Unfolding the Netherlandish Diptych, National Gallery of Art, Washington, D.C.; Koninklijk Museum voor Schone Kunsten, Antwerp, 2006-2007, no. 36, repro. The Master of Flémalle and Rogier van der Weyden, Städelsches Kunstinstitut und Städtische Galerie, Frankfurt; Kulturforum, Berlin, 2008-2009, no. 21, repro. The picture is painted on a panel with a vertical grain, which is set into a larger panel with vertical grain, which in turn is mounted on another panel with horizontal grain. The painting is in good condition. A vertical split left of center runs the length of the panel, and small flakes of paint have been lost along the split. Minor treatment was administered to the lower portion of the split in 1976 to increase the security and adhesion of the paint. On the reverse of the panel are two seals and a small piece of paper. The paper bears an inscription in what may be a sixteenth-century German hand: A07 / Videatur et pondere- / tur ab arte reperitis, and in a different hand: albrictür. The seal at the upper left seems to bear the words BUREAU BERLIN and an intertwined monogram FR; the seal could indicate Royal Prussian possession between the time of Frederick the Great and the middle of the nineteenth century, or it could simply be a customs seal. The seal at the lower right corner bears a coat of arms that has been identified with a high degree of probability as that of the Polish family Grudna-Grudzinski. The Latin phrase may be translated, "Look and ponder, from art you will learn." The source of this quotation has not yet been determined. It is possible that the word albrictür may refer to Albrecht Dürer and thus reflect an early attribution. Both seals are identified and discussed by Dr. Zimmermann, Director of the Geheimes Staatsarchiv, Berlin, in a letter to Robert Oertel, Director of the Gemäldegalerie, Berlin, 22 January 1966, in the curatorial files. Oertel, in a letter of 9 February 1966, to Carmen Gronau of Sotheby's, also adds to the discussion, noting that the seal at the upper left may be a customs seal. It has not been possible to find mention of 1966.1.1 in the collections of Frederick the Great or the Grudna-Grudzinski family. It should be noted, however, that Joanna of the house of Grudna-Grudzinski married the Russian Grand Duke Constantine on 24 May 1820. She received the title of Princess von Lowicz (Jnowraczlaw) from Czar Alexander. If the painting did belong to the Grudna-Grudzinski family, it is possible that it came to Saint Petersburg through the person of Joanna. Perhaps it was given to her as a wedding present. Phillips, Claude. "Impressions of the Bruges Exhibitions." The Fortnightly Review N.S. 72 (1902): 598. Winkler, Friedrich. "Weyden, Rogier van der" and "Meister von Flémalle." In Thieme-Becker. 37 vols. Leipzig, 1907-1950: 35(1942):475, 37(1950):100. Weale, W. H. James, and Maurice W. Brockwell. The Van Eycks and Their Art. London, 1912: 161-162, no. 30. Phillips, Claude. "Burlington Fine Arts Club. Winter Exhibition." Daily Telegraph (18 December, 1920): 6. Conway, Martin. The Van Eycks and Their Followers. London, 1921: 63. Fry, Roger. "The Burlington Fine Arts Club." The New Statesman 16 (1 January, 1921): 392. Hulin de Loo, Georges. "Quelques notes du voyage. 1. Un document catalan concernant un Saint Georges peint par Johannes van Eyck." Académie Royale de Belgique. Classe des Beaux-Arts. Bulletin 7, nos. 6-9 (1925): 100-104. Demonts, Louis. "L'Exposition d'art flamand à la Royal Academy de Londres." Gazette des Beaux-Arts 15 (1927): 261, repro. Devigne, Marguerite. "Notes sur l'Exposition d'art flamand et belge à Londres, 1." Oud Holland 44 (1927): 68-69, fig. 1. Schneider, Hans. "Die Ausstellung flämischer und belgischer Kunst in London." Zeitschrift für bildende Kunst 61 (1927/1928): 39, repro. Winkler, Friedrich. "Die flämisch-belgische Ausstellung in London." Der Kunstwanderer (February, 1927): 222. Renders, Emile. "The Riddle of the Maître de Flémalle." The Burlington Magazine 54 (1929): 292. Renders, Emile. La Solution du problème van der Weyden Flémalle Campin. 2 vols. Bruges, 1931: 2:35, pl. 6. Hulin de Loo, Georges. "Rogier van der Weyden." In Biographie Nationale de Belgique. 29 vols. Brussels, 1938: 27:col. 233. Tolnay, Charles de. Le Maître de Flémalle et les frères van Eyck. Brussels, 1939: 46, 57, no. 9, fig. 19. Beenken, Hermann. "Rogier van der Weyden und Jan van Eyck." Pantheon 25 (1940): 129-130, 136-137. Musper, Theodor. Untersuchungen zu Rogier van der Weyden und Jan van Eyck. Stuttgart, 1948: 58, pl. 27. Beenken, Hermann. Rogier van der Weyden. Munich, 1951: 29-30, 33-34, 44, fig. 12. Baldass, Ludwig. Jan van Eyck. London, 1952: 17, 89. Gamber, Ortwin. "Harnischstudien: V. Stilgeschichte des Plattenharnisches von den Anfängen bis um 1440." Jahrbuch der kunsthistorischen Sammlungen des allerhöchsten Kaiserhauses (Jahrbuch der kunsthistorischen Sammlungen in Wien) N.F. 14 (1953): 78, no. 146. Panofsky Erwin. Early Netherlandish Painting: Its Origins and Character. 2 vols. Cambridge, Mass., 1953: 1:425-426, 2: pl. 141, fig. 273. Röthel, H. K. "Die Ausstellung flämischer Malerei in London." Kunstchronik 7 (1954): 89. Röthel, H. K. Review of Rogier van der Weyden by Hermann Beenken. In Kunstchronik 7 (1954): 74-75. Sutton, Denys. "Flemish Painting at the Royal Academy." Les Arts Plastiques 6th ser. no. 6 (1954): 6, 8, 69, fig. 1. Weiss, Roberto. "Jan van Eyck and the Italians." Italian Studies 11 (1956): 12. Winchester Cathedral Record 25 (1956): 25-26, pl. 9. Nicolson, Benedict. "Pictures from Hampshire Houses." The Burlington Magazine 99 (1957): 273. Birkmeyer, Karl M. "Notes on the Two Earliest Paintings by Rogier van der Weyden." Art Bulletin 44 (1962): 329. Frinta, Mojmír. The Genius of Robert Campin. The Hague, 1966: 28, 35. Frohlich-Bum, L. "Der heilige Georg als Drachentöter von Hubert van Eyck." Die Weltkunst 36 (1 March, 1966): 171, repro. Cott, Perry B. In Hugh Broadley. Flemish Painting in the National Gallery of Art. Rev. ed. Washington, 1967: 4, 16, repro. 17. Gelder, J. G. van. "An Early Work by Robert Campin." Oud Holland 82 (1967): 3. European Paintings and Sculpture: Illustrations (Companion to the Summary Catalogue, 1965). Washington, 1968: 126, no. 2310, repro. Peman y Pemartin, César. Juan van Eyck y España. Cadiz, 1969: 37-39, fig. 15. Châtelet, Albert. Review of French Painting in the Time of Jean de Berry by Millard Meiss. In Revue de l'Art no. 8 (1970): 83. Davies, Martin. Rogier van der Weyden. London, 1972: 33, 222-223, pl. 86. Schabacker, Peter H. Review of Rogier van der Weyden by Martin Davies. In The Art Quarterly 25 (1972): 423. Bruyn, Josua. "A New Monograph on Rogier." Review of Rogier van der Weyden by Marin Davies. In The Burlington Magazine 116 (1974): 540. Meiss, Millard. French Painting in the Time of Jean de Berry: The Limbourgs and Their Contemporaries. New York, 1974: 243, fig. 754. Walker, John. Self-Portrait with Donors. Boston and Toronto, 1974: 41-42. European Paintings: An Illustrated Summary Catalogue. National Gallery of Art, Washington, 1975: 374, repro. 375. Smeyers, Maurice. "Een collegeschrift van de oude Leuvense Universiteit (1481-1482). Een codicologisch en iconografisch onderzoek." Arca Lovaniensis 4 (1975): 281, 285, fig. 12. Walker, John. National Gallery of Art, Washington. New York, 1975: 125, pl. 121. Watson, Ross. The National Gallery of Art, Washington. New York, 1979: 50, pl. 32. Randall, Richard H. Jr. "Jan van Eyck and the St George Ivories." The Journal of the Walters Art Gallery 39 (1981): 41, 44, 47, fig. 2. Lane, Barbara G. The Altar and the Altarpiece: Sacramental Themes in Early Netherlandish Painting. New York, 1984: 25-35. Walker, John. National Gallery of Art, Washington. Rev. ed. New York, 1984: 125, no. 115, color repro. European Paintings: An Illustrated Catalogue. National Gallery of Art, Washington, 1985: 436, repro. Hand, John Oliver and Martha Wolff. Early Netherlandish Painting. The Collections of the National Gallery of Art Systematic Catalogue. Washington, 1986: 246-253, color repro. 247. National Gallery of Art, Washington. National Gallery of Art, Washington, 1992: 36, repro. Hand, John Oliver. National Gallery of Art: Master Paintings from the Collection. Washington and New York, 2004: v, 46, no. 31, color repros. Georgi, Katharina. “The Master of Sierentz.” In Konrad Witz. Exh. cat. Kunstmuseum Basel, 2011. Ostfildern, 2011: 282-283, under no. 60, nt. 7, color fig. 128.